The project is for the complete restoration and enhancement of this historic and most important church, right in the very heart of London. Corpus Christi was opened by Cardinal Manning on the 20th October 1874. Built in reparation for all the sins committed against the Blessed Sacrament in the 16th century and since. The intention of Cardinal Manning was that it would stand here as a statement of what the Catholic Church believes about the Mass i.e. the Body and Blood of the Lord, and as “a sanctuary created specifically for the Adoration of the Blessed Sacrament”. (Words of Cardinal Manning, from his homily at the opening of the church). After a long period of neglect, exacerbated by considerable pollution in Central London, and clumsy attempts to clean the internal fabric by sandblasting, the interior walls and stone work were fully painted out with Artex and other modern paints in the 1970s. The church is looking tired, unloved and in much need of restoration to its former glory. 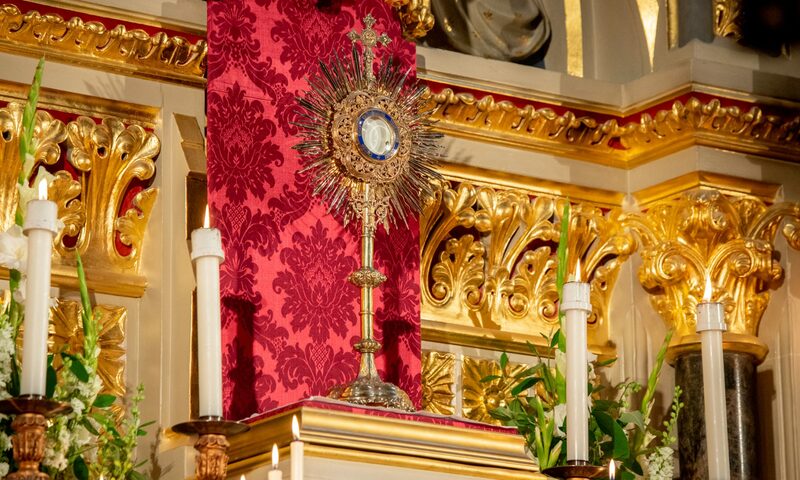 His Eminence, Vincent Cardinal Nichols requested the complete restoration of Corpus Christi and the work is beginning to draw to a successful conclusion. New Stations of the Cross have been donated by the widow of Arthur Fleischmann, and these have been restored and installed. The Lady Chapel has been designed after the Holy House in Loreto and a statue of Our Lady of Walsingham was installed and blessed by Bishop Alan Hopes of East Anglia in September 2015. The Sanctuary had the dirty paint and Artex stripped away, with the reredos and walls being redecorated and gilded. The carved stone work was highlighted and repainted to show its former glory. The statues of Ss. Peter and Paul were restored to their original colours, having been coated in thick and ugly whitewash. They also had their halos restored. Canopies were designed based on photographs of the originals. Seven sanctuary lamps were hung, restoring the original designs and replacing those that were ripped out in the 1990s. Although much of the work has been completed, there are still various projects that need funding. The disabled chairlift at the back of the church has broken and, due to its age, is beyond repair. This means that the church is not accessible to wheelchair users or people with limited mobility at all. We have received a quote of £13,675.20 for a new chairlift, but are now trying to raise the funds to cover this. We have already received a generous donation of £5,000 towards this cost, so still need to raise another £8,675.20. Might you please be able to help us? Any donation, no matter how small, would be gratefully received. To donate, please click this link. Corpus Christi was build at a time when it was still illegal to build Catholic churches in prominent positions, such as main roads. Therefore many people walking down Maiden Lane completely miss Corpus Christi and walk past it. To help make the church more visible from the street and to help draw more people in, we would like to replace the wooden front doors with glass and iron gates that make the main entrance more appealing and make it more immediately obvious that this is indeed a church. We have already received permission to install these gates, but now need to raise the funds to have them made and fitted. To donate, please click here. The most obvious way is to make a donation towards the restoration work. This can be done by using one of the forms in the church or downloaded from the website (see the PDF at the bottom of this page which you can open and download to fill in). This will enable you to make a gift by cash, cheque or bank transfer. You can either hand your donation to the priest, put it through the letterbox of the Presbytery or send it to us through the post. If you pay tax, please do complete the Gift Aid part of the form. This will enable to parish to receive a further 25p for each £1 that you donate, at no cost to yourself. You can also make a donation via Paypal on our website Donate page. Something that absolutely anyone can do to help and support us is to pray for us and the work that we are carrying out here at Corpus Christi. That really is just as important as the money we receive to carry out the physical work: prayer is fundamental to enable us to keep moving forwards. So please do pray for us. Thank you and God Bless you. Help us complete the restoration! – Lord Fellowes of West Stafford, writer of “Downton Abbey”, speaking of Corpus Christi. This Parish is part of the Westminster Roman Catholic Diocesan Trust.